Don't be fooled by the high version number here. The Glycerin has continued to evolve over the years and with the 16, and now the 17, the shoe now features Brooks' new lively DNA Loft midsole foam. The Glycerin formula has been as flexible, plush, soft heavier trainer which was good for ambling along mostly, leisurely. With DNA Loft in the mix and other changes, in the 16 and now in the 17, the Glycerin becomes a more versatile and livelier yet still super plush trainer. It has to be good as it is the trainer choice of Desi Linden, 2018 Boston Marathon winner. Runs lighter than actual weight. Harmony of upper and midsole creates a nice ride. Didn’t read the above until after a run...yup, a little low over the toes. Trim nails! Somewhat dense upper, especially at mid foot. Bumper is a low and wide over the front of the toes, with a pronounced sole curve up. Weight. if the Glycerin could lose half an ounce or more it would be perfect. Hope is in her 20’s and after several ultras is now more on the road. She has a marathon PR of 3:47. She trains about 50 miles per week with many of her runs in the (broad) 8:00-10:00/mile range. She is happy to hit 7:30 miles on tempo days. Jeff Beck is the token slow runner of the RTR lineup as such his viewpoints on shoe and gear can differ from those who routinely finish marathons in three hours or less. Jeff runs 30 miles per week, both roads and desert trails in North Phoenix, Arizona. He has a PR's of 4:07 marathon and 5K at 23:39 both he is working to demolish with help from his coach and fellow RTR tester Dave Ames. Sam is the Editor and Founder of Road Trail Run. He is 61 with a recent 3:40 Boston qualifier. Sam has been running for over 45 years and has a 2:28 marathon PR. These days he runs halves in the 1:35-1:41 range and trains 40 miles per week mostly at moderate paces in the 9 minute range. He is 5'10" tall and weighs about 165 lbs. Peter lives in Austin, Texas and is sub 3 hour in the marathon in recent years as well as a 1:25 half marathoner. Jeff :The look has changed slightly around the midfoot, but otherwise this is the same shoe I raved about a year ago. The Glycerin 17 boasts a truly plush midsole that excels at long slow runs (but can put in double duty for a tempo run or fartlek) mated with a grippy and durable rubber outsole that covers most of the midsole. In regards to fit, I’ve found that going up a half size from my true to size 10.5 up to 11 in the Glycerin works well for my foot. Length-wise I just barely have a thumbs width between my large toe and the end of the shoe, while not feeling too baggy in any part of the upper. Most Brooks shoes I wear true to size, but for whatever reason the Glycerin benefits from the extra bump up for me. Peter: I haven’t run in the Glycerin before--and based on the weight I was kind of dreading it. I had a surprisingly enjoyable first run in them. They felt lighter than I thought they would, the ride is cush but not mushy and aside from being just a hair low over my second and third toe, the upper was sublime. I can see going up half a size in them. Sam: Plush now is off the couch! My last Glycerin the 15 was soft all over, truly comfy slippers top to bottom but not that much fun to run in. With the 17’s (and 16 I did not run) Brooks gives the shoe a comfortable but more secure and dialed upper and a liviler midsole. I found the 15 flexible but oh so soft and not much for moving along. I was eager to see what soft, bouncier DNA LOFT midsole felt like “full slab” unlike the Ghost 11 where it is only at the rear with the more dull BioMoGo EVA upfront. The fit was true to size but as others have noted a bit low over the very front of the toes. I think the toe bumper stiffener is a touch low and wide with the shoe geometry curving up a bit abruptly at the front to that stout outsole wrapped up piece, potentially all together pressing down a bit on the toes as we all noted. Hope: Many moons ago I ran my first sub-2:00 half marathon in the Glycerin 11. I had just flown into Portugal for a business trip and since my boss at the time was also a runner he got me out of some work responsibilities so we could run a race together. Having never gone below 2:00 in my life I laid down 1:53 with legs still swollen from an international flight. To say that I have a good impression of the Glycerin as a comfortable, forgiving model would be an understatement. The Glycerin 17 furthers this line’s reputation for premium comfort and good looks. As others have said, the fit is great. I have the usual thumb’s width of room between my big toe and the end of the shoe in a women’s 9.5. Few shoes can rival the step-in comfort of the Glycerin 17. The black and pink colorway is fairly understated, but still fun enough to look like a performance running shoe (and not, say, a security guard uniform shoe). Jeff - Brooks slightly refined the double mesh upper they used on the Glycerin 16, and the results are positive, if subtle. Last year’s shoe had a series of plasticy rubber overlays at the toe cap and around the midfoot, while this year’s shoe ditched them for the small rubbery hexagons that mark the midfoot. The overlays on the 16 gave the shoe a little more shape and resiliency, while the hexagons on the 17 seem largely for looks. The end result? Negligible differences. The mesh of the 17 feels like it is wound just a little bit tighter, and as a result the toe box is just a hair smaller - but that does not mean this shoe has a cramped front end. Lastly, and perhaps leastly too, the biggest change for the new model is a new shoe lace. The 17 uses a very flat almost ribbon like lace that holds a knot well, the 16 used a much thicker and softer lace that felt like it was coming undone, even when it wasn’t. Peter--As plush and comfy an upper as any I’ve run in this year. It may be a bit much material as weather turns to summer, but so far no problem. The toe box is a bit cramped (low) over the center toes as I pointed out above, but if your nails are trimmed you’re probably fine. I LOVE the flatter laces, they have a little stretch to them and stay tied. The upper holds the foot well, the ankle collar is well padded but not at all intrusive. The tongue is nice and soft and just the right thickness. Hope: I love this upper for its foot hugging wrap and its comfort, but I have a couple of caveats. I had to mess with the lacing a bit to get a secure heel hold in the Glycerin 17. Once I pulled the laces a bit more snugly I had no problems. The tongue is thick, so the lace pressure I feared isn’t a problem and the laces really are vital to ensuring lockdown. They are excellent laces: I found myself distractedly trying to undo a knot with one hand and I couldn’t do it. These thin elastic laces stay tied! The G17’s thick tongue is comfortable, but it’s part of an upper that’s generally thick overall. This contributes to weight and as Peter mentioned, it could be overly warm during the summer months. Beyond the somewhat low altitude over the toes, I have nothing to complain about here. A smooth fitting secure foothold which while dense is all of a piece. The materials and construction blend comfort and support just right. This is not a loose overly voluminous upper in a D so wider feet may want to consider the available 2E width or sizing up. Jeff - Brooks stuck with their DNA Loft cushioning foam, and we’re better for it. 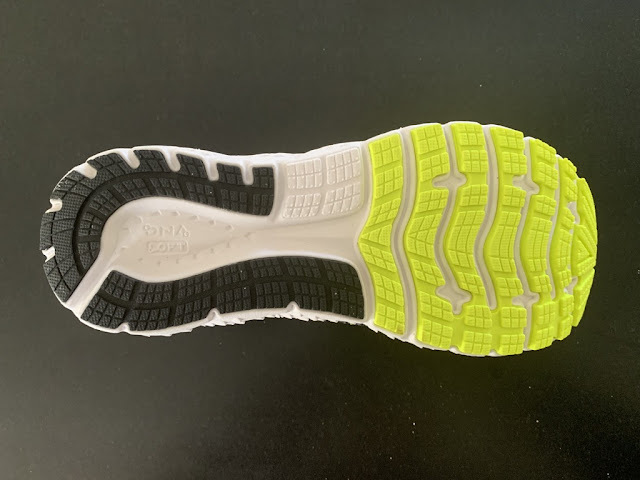 While most companies (including Brooks) have been trying to integrate a splashier/sexier/updated material TPU midsole into the premium trainers, the DNA Loft EVA foam is the best cushioning Brooks has in its lineup currently, and luckily they stuck with it in the Glycerin. A solid blend of that nice plushness that is apparent from the moment you slip your foot in at the store (and is still comfortable for the final minutes of a ten mile run) without going too far in that direction that gives a sluggish feel, DNA Loft is one of the best EVA midsoles in the business. Running with the 17 on my right foot and the 16 on my left, I could feel zero differences between the two models underneath my foot. While you may take that as a criticism, I see it as a company that knows they got it right, and decided not to change anything that didn’t need to be changed. Every runner has found “their” shoe, only to realize the following year’s model ruined what made it special. Brooks didn’t do that to Glycerin 16 devotees, and you get another year of a dependable solid daily trainer. Peter--This is my first DNA Loft shoe and it’s so much nicer than DNA BioMoGo. I think I remember Sam saying something about Brooks should put this foam in the Launch--that would be a terrific idea. It’s a beautiful mix of soft and responsive. There’s plenty of protection and plenty of energy return. I was really pleasantly surprised by the feel of the Glycerin and I think most of that is the use of DNA Loft. Sam: DNA Loft is one fine midsole foam. It is soft and has a fine rebound. It never felt energy sapping, mushy, or even ponderous given the overall weight of the shoe as the Glycerin 15 often did. I really like the single slab approach here (and in many newer shoes) vs. the Ghost 11’s heel DNA Loft with the more conventional BioMoGo up front. The feel is consistent, the transitions and flex are smooth and easy. Of course the outsole and its firmness and how it matches and flexes with the midsole plays a huge role and here Brooks put the two together brilliantly. Hope: I running out of superlatives since I’m excited about a lot of 2019 shoes. The G17’s midsole is sublime. It’s a blend of bounce, flexibility, softness, and comfort that Brooks is going to struggle to improve in subsequent models. It’s that good. It’s like the platonic ideal of what a trainer should feel like. I stepped into the G17 and I thought, “oh, this is what I’ve been waiting for from a trainer.” The bounce, flexibility, softness, and comfort are all immediately apparent. I did my testing in the immediate run-up to and recovery from a marathon, so I haven’t yet taken them for a long run, but based on how smooth and responsive they were for short efforts at an easy pace, I feel confident that they’ll handle long runs well too. If I had to quibble with anything about the midsole, it might be that it’s almost too bouncy. There’s enough softness in the heel that it’s not as stable as I’d like for it to be. I’m not generally a heel striker, but I noticed that I wasn’t entirely sure footed if I landed on my heel on even a slightly uneven surface like an uneven sidewalk. This was noticeable to me while walking in the G17 too. If it’s possible to mold the midsole so the heel is denser while keeping it all one piece, that might resolve this (minor) issue. Jeff - When you look at the comparison photos you’ll notice that like the midsole, the outsole is unchanged from last year. Segmented rubber covers the vast majority of the shoe, providing great grip and traction for any run. I ran the 17 in a few different conditions (slight rain, warm and dry, and groomed trail) and the outsole was great for everything I faced. The seven creases that break up the rubber pods allow the forefoot of the shoe to have enough flex. Some thicker shoes tend to give me foot discomfort around the ball of the foot five miles into the run and I typically attribute it to a shoe’s lack of natural flex. That never showed up with the Glycerin 17. The only (very) minor gripe I have is the exposed EVA pod along the lateral edge near the midfoot. As a supinator I will wear that part down, and I can’t imagine if it was covered in the same rubber the rest of the shoe is it would cause a massive weight gain or lose flexibility. But, a very minor gripe. Peter-I was concerned that the fairly substantial (at least compared to the current trend of lots of exposed midsole and a little bit of rubber) amount of outsole rubber on the bottom of the Glycerin 17 would make for a clunky riding shoe. Man, was I wrong. They’ve dialed in the flex grooves to perfection on this shoe. It grips like mad while riding super smooth. They’re also not loud or ‘slappy’ at all. This should be an outsole that lasts forever. Sam: What both Peter and Jeff said! I would add that a key characteristic of the Glycerin is its flexibility. That was the case with the 15 as well but somehow here instead of laboring through that flexibility to toe off on soft pillows, the outsole geometry and rubber provides a fairly stable yet soft and flexible front platform and near perfect rear that is neither overly soft or harsh in feel. This tells me the front rubber firmness is quite soft and all those seven creases really dialed to perfection. Jeff - The Glycerin 17 remains one of the smoothest riding easy run shoes on the market today. Plush and smooth, this is one of those shoes that just disappears on the foot and lets you run. If I had to do a physical qualifier around a track the Glycerin wouldn’t be in my top 5, but if you are sporting them on a group run and the pace works its way up to 5K/10K race pace, the shoe won’t get in your way. The Glycerin 17 is the ideal shoe for the mid-pack runner to wear to a half or full marathon - and then wear out to grab lunch with friends right after. All day comfort with plenty of performance cushioning is a hard combination to beat. Peter- I was really surprised by the smooth, easy ride of the Glycerin 17. I was extremely comfortable at slow paces and actually got more energy return than I expected when I turned on the gas. They wouldn’t be a race day shoe or a speed work shoe for me, but they feel so smooth I’ll pull them out for any other run. They roll through the gait cycle really naturally and protect the foot without ever feeling mushy or too soft. Hope: Jeff and Peter said it well. The G17 runs smooth and frankly feels a lot more comfortable than is fair to the competition, but it gamely picks up the pace. Sam: While I did not run the very similar 16, I did the 15 and the ride is much improved. Still soft and flexible, the combination of DNA Loft and just right outsole firmness and flex provides a soft yet somewhat responsive ride. The responsive part is clearly felt and coming from the outsole. The 15 was soft and ponderous in comparison. The Glycerin 17, while still quite heavy, now has some pop which made it suitable for both recovery runs and more energetic daily runs for me. -0.1 for weight. It doesn’t feel heavy, but if it was a ~10 ounce shoe you might be looking at daily trainer perfection. Pushing the scale at 11.7 ounces for my size 11 no one should confuse the Glycerin 17 for a lightweight uptempo runner, but as a comfortable daily trainer you could do much worse. Don’t pay too close attention to the number on the scale, the Glycerin continues to run lighter than it should. Brooks has changed very little of a shoe that I raved about a year ago, and after dropping a half ounce I’m having a hard time finding a valid criticism. If you are the type of runner that has only one shoe in their rotation, the Glycerin can fill that role wonderfully. The heavy duty daily trainer category has a number of contenders with various strengths and weaknesses, but the Brooks Glycerin 17 should be in consideration for any runner. I agree with pretty much everything Jeff said above. They run lighter than the numbers would indicate and they are very, very comfortable. I deduct for low toe box. It’s most troubling on downhills--it hasn’t caused any major issues yet, but there are definitely times when my third and fourth toe seem to scrape the ridge at the front of the toe box. . Consider sizing up.. I’ve been running in lots of “Max cushion” shoes lately due to an injury and most of them are just maximally unenjoyable. The Glycerin is a delight to run in. How is it that in the year 2019 Brooks is still putting out a trainer that’s nearly 10 oz in a W9.5? That’s my only real beef. The G17 runs a lot lighter than its weight, but over long distances the numbers on the scale have a way of catching up with you and there’s the potential for unnecessary leg fatigue. I can get past the extreme bounciness of the heel (oh no, the shoe has too much bounce? What a nice problem to have!) because overall the smooth-riding midsole achieves a truly special level of cushioning and responsiveness. The thick upper might prove too warm in the summer, but it also wraps my feet well and just feels good. I wouldn’t pick the G17 for a half marathon now, but I think they’d make newer runners and bigger runners happy as a long distance racer. For the rest of us, the G17 is a trainer that will hold up to countless miles of abuse. I’ll second Jeff’s assertion that runners aiming to have a single shoe rotation should take a look at the G17. While it might not be the optimal choice for all paces and all workouts, it stays out of the way so you won’t be thinking about your shoe choice when all you should be thinking about is your run. Going to agree with the others that weight is my only real issue with the Glycerin 17. A more streamlined heel area and rear of upper might help reduce weight. This said you get a near maximal, if not maximal at the heel shoe with a stack height of 32 mm heel / 22 mm forefoot all in a shoe weighing less than 11 oz with plentiful durable rubber and a stout, maybe a touch dense upper. While they absolutely run lighter than their weight due to the lively midsole and front flexibility, I could still feel the tale of the scale. For sure less so than many others that are up there in weight but there in a slight sensation that I had to lift and swing them along with a touch more effort than I prefer in a daily trainer. This minor issue aside, the Glycerin 17 is by far my favorite recent Brooks, for what it is and for not trying to be something else. It is a plush highly cushioned daily trainer that protects and supports and isn't at all a bore or a chore to run at most all paces. Jeff - Which Glycerin should you wear? Considering that the 16 is still being offered in a number of colorways at a nice discount, it is hard to go that route. The shoes run the same, so unless a half ounce (which is not noticable) and slightly better shoe laces are that important to you, save the cash and go with last year’s model. Then if the Glycerin 18 is a major overhaul in a direction you don’t like, you can stock up the 17 and keep the party rolling. Jeff - The 1080v9 was nearly my shoe of 2018 (and would have been if only Hoka hadn’t released a Challenger with a well shaped toe box) and I’ve continued to enjoy running in it. It is one of the few trainers on this list that comes in lighter than the Glycerin (my 10.5D is 1.1 ounces lighter than the 11D Glycerin), and it feels more sporty. But, the upper has issues with foot hold, and while many runners would be able to take it for a half/full marathon, it doesn’t have the same level of cushioning/forgiveness than the Glycerin. If your race pace is 9:00 or faster, I’d lean toward the 1080v9, if slower than that, check out the Glycerin. And if you want one shoe for everything, definitely the Glycerin. Peter-My heel comes flying out of the 1080 v9. Glycerin for the win. Hope:-My thinking matches Jeff’s. Heel lock lacing solved the beyond lackluster heel hold of the 1080v9 for me. It’s got more pop, but the G17 is more comfortable. For my money, I’d pick the 1080v9, but if I were asked to make a recommendation to a runner without knowing anything about them, I’d choose the G17 since its fit and comfort are bound to make just about anybody happy. Sam: A tough call. I had no real heel hold issues with the 1080v9. I give its lighter yet still very supportive and more performance oriented upper a slight nod over the G17's. Checking in at about 0.8 oz lighter, the 1080 clearly is lighter and a faster pace oriented shoe. This said the Glycerin is more flexible and more cushioned so easier to run slow. If you need is for a slower days, softer shoe the Glycerin. If you need a more performance oriented all around trainer the 1080. Sam: The latest Ghost is only 0.4 oz lighter than Glycerin. It has DNA Loft in the heel and more conventional and firmer BioMoGo up front. It has a 12mm drop vs. the Glycerin's 10mm which I find a bit much. 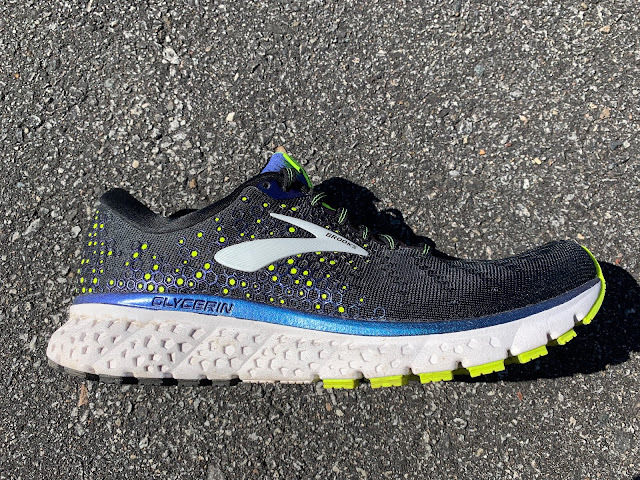 It is slightly snappier and more responsive, fitting more in the class of the lighter 1080v9 as a daily trainer than the more cushioned and plush Glycerin. The choice depends on preference and use. For recovery and slower runs no question the Glycerin. For a touch more response and stability up front for faster miles the Ghost. Overall I get more smiles out of the Glycerin. 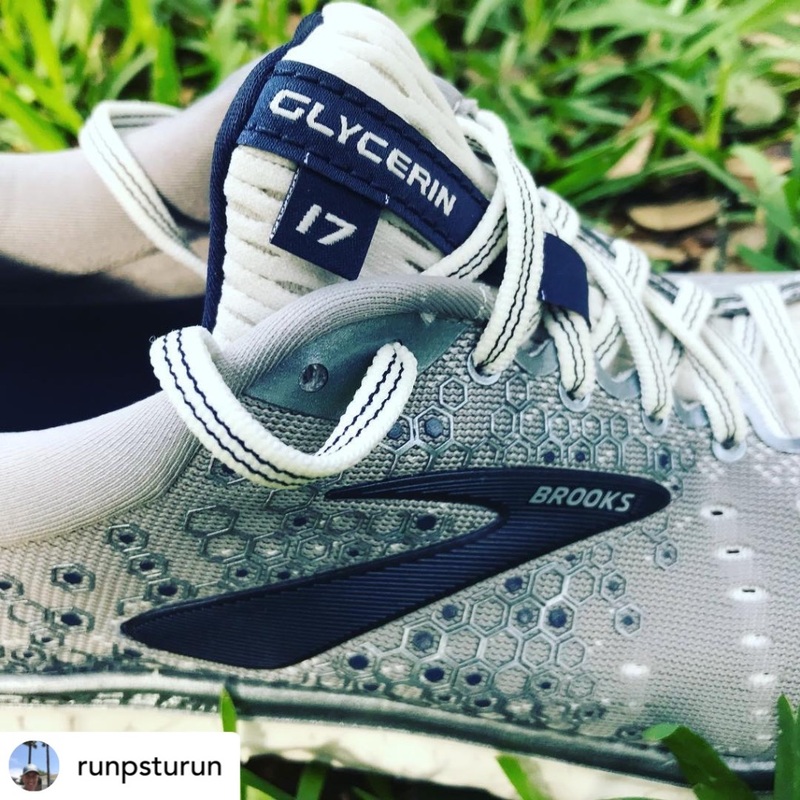 Peter: I know the Ghost is the among the, if not the most popular running shoe in the Brooks line, but the Glycerin is a much more enjoyable shoe for me. There’s a little more cushion, a little more energy return, a little more flexibility and a lot more smiling in the Glycerin. DNA loft is, for me, a much better ride. Jeff - The FFM has a lighter weight and more material underfoot, while the Glycerin has a better shape and more flexibility. Both outstanding shoes, and while the FFM is better uptempo, I’d take the Glycerin and its more plush (shockingly) ride. Also a retired Glycerin makes a good casual shoe, the FFM does not. Peter- The FFM tried to kill my ankles, upper on the Glycerin is a thing of beauty. Hope: In the FFM I think you have to trust that cushioning action is happening without being able to necessarily sense it. The softer G17, despite its lower stack height, lets you feel the cushioning more. I’d be happier running in the FFM for faster stuff, but I’ll sacrifice some speed for the vastly more flexible outsole offered by the G17. Sam: I agree with Hope and Jeff. The FFM cushion and ride is "faster" and clearly more responsive but for me the shoe is limited by its overly voluminous upper and difficulty to toe off due to some combination of inadequate rocker given lower drop or stiffness (it is super stiff) or some combination. Sam: You want dull and stiff in a highly cushioned daily trainer, pick the Infinite. 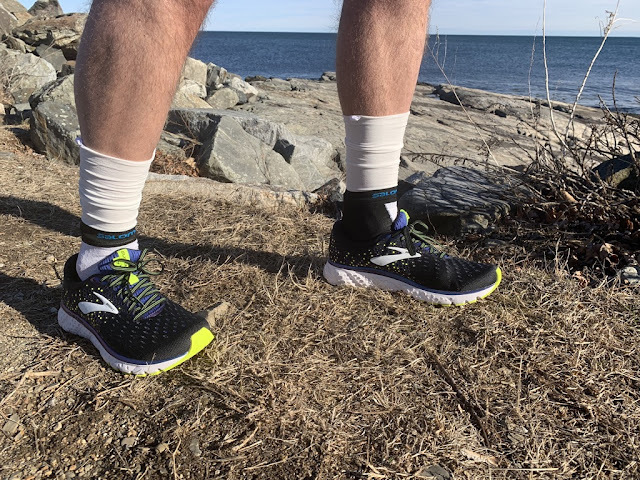 The support oriented and considerably heavier Guardian actually runs quite similarly to the Glycerin 17 as it has a more flexible forefoot so if you want a combination of not noticed but real pronation control and flexibility the Guardian is a good pick. Jeff - The Nimbus weighs the same, but the upper isn’t as comfortable, the midsole has less flex and isn’t as plush, and just doesn’t run as smoothly. Glycerin 17 all day long. Sam: Concur 100% with Jeff although I do think the Nimbus may be a touch faster. Sam: You get a similar quite dense and supportive yet I think overall superior upper in the MetaRide and a completely stiff zero drop shoe with a similar 30mm heel and with a pronounced front rocker instead of a flexible forefoot. The contrast in cushion is also striking. Highly cushioned as well the MetaRide's two types of FlyteFoam lead to a dense more responsive overall ride but the added weight does get in the way of fun. The Glycerin is a safer bet but if you want a smooth distinct rocker and easier more pronounced pop consider the MetaRide if cost is no object as it cost $100 more. Jeff - The Saucony is more than an ounce heavier, but the two shoes might as well be the Coke and Pepsi of this lineup. Both have great feeling uppers that are very accomodating, both have great midsoles that works at all paces, and both have grippy and durable outsoles. Go Triumph if you want more room up front, go Glycerin if you want a little more plush or flexible ride. Hope: Ha! Coke and Pepsi is a great comparison! Give me a glass of the sweet, sweet outsole flexibility of the G17. T5 is an excellent shoe, but toe-off is just a bit smoother in the G17. Sam: While mighty fine, the lighter Glycerin for me. The added weight of the full Everun midsole tips the balance. Jeff - If you don’t like the way Boost runs, go Glycerin. Otherwise, the UB19 might be your shoe. Very similar in ride quality, the Glycerin feels more plush while the UB19 feels like more of a performance trainer. As nice as the soft mesh upper of the G17 is more comfortable, the primeknit upper of the Ultra Boost holds the foot better. Glycerin has a slightly bigger toe box. Ultimately? Ultraboost 19 by a nose. Jeff - The Solar Glide is a half ounce lighter, and feels very much like an uptempo alternative to the Glycerin. While stack heights and applications are similar, I’d take the Glycerin in a heartbeat for longer slower runs, and the Solar Glide for shorter runs or uptempo training days. Only one for everything? Glycerin 17. Jeff - Coming in an ounce and half lighter, the Predict RA is the spoiler here. It feels every bit as cushioned and nearly as soft/plush, with an even nicer upper and a better uptempo feel. Long slow runs I’d favor the Glycerin slightly, everything else, I’d take the Predict RA. Hope: The Predict RA didn’t really work for me. It’s not bad, but I wasn’t inspired and I think I should’ve been considering the price and the crtaftsmanship. I appreciate its lighter weight, but I think the G17 runs faster, smoother, and more quietly. Sam: The Predict RA upper and superior ground connection feel wins out for me in terms of overall experience. This said if you don't mind the weight and want a softer more cushioned ride, Glycerin. Jeff - The Glycerin is more plush, but the Ultrafly 2 midsole gives nearly the same protection. The Topo is a half ounce lighter, but it feels much more than that. Ultimately, this matchup is a single-issue voter: toebox size. If you want more, go Topo and stop thinking about it, if you don’t want the extra space, the Glycerin is your shoe. Jeff - Both have plush uppers (with the Cloudswift winning in comfort) the midsole and ride are differently similar. 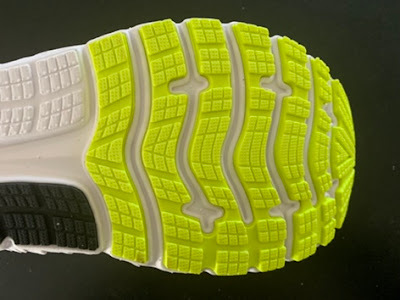 The On shoe is much firmer and faster feeling, while the Glycerin is much more plush. If you are looking for a differently feeling running experience, check out the On, but the Glycerin is a much easier sell. 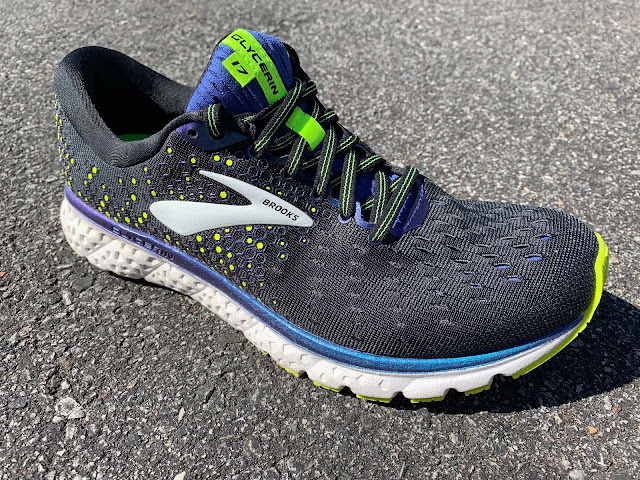 Jeff - Brooks went all out with the new materials in the Levitate 2 using a PU midsole, knit upper, and partially translucent candy rubber - but the result is a heavier shoe by an ounce that doesn’t fit as well or ride as smoothly as the Glycerin 17. It’s the G17 all day long. Sam: Same for me. While the Levitate has a nice more pneumatic measured feel to compression and rebound it is heavy even in comparison to Glycerin. Now don't get me talking about the somewhat (0.4 oz) lighter Ricochet (review) also with some PU in a sandwich with Brooks BioMoGo DNA. It is dull and lifeless in comparison to Glycerin but nonetheless with about equal cushioning protection especially up front. SHOP FOR BROOKS GLYCERIN 17 and 16, SAVE BIG ON 16! I just purchase a pair of Epic React 2s. How would you compare it to the glycerin? For me the Reacts run like a well cushioned shoe in the same category as Triumph ISOs, glycerins, boosts. Well Epic React 2 is considerably lighter and yes is very well cushioned for sure. The Glycerin 17 has 4mm more stack front and back and I think a superior outsole with easier flex than Epic React 2 and a smoother upper overall. This said the lighter weight of the Epic React 2 is a huge factor, almost 3 oz lighter. Certainly the Best Glycerin since the 10. Thanks for the great reviews. Thanks for kind words. G15 was my first and thought likely my last but DNA Loft brought me back. Honestly, I think weight (and their poor logo) is what keeps Brooks from being an A-1 brand on the level of Nike or Adidas. And kudos to Hope for PR-ing in the Glycerin 11! That one was a monster. Is the Glycerin 17 as soft of a ride as the Triumph ISO 5, or it it softer? Thanks! Tough to answer. Equally soft with G17 maybe having a softer midsole foam but with for me G17 having a slightly better paired outsole in terms of flow and stability and also with somewhat firmer rubber and yet with more front flexibility as well. Bottom line both have tons of soft cushion with T5 overall softer but G17 runs smoother for me. and is 0.7 oz lighter as well which is felt.